From now to 2019 . . . our output falls into the Jazz/Ether Jazz category 41.2% of the mixological time. And, in the beginning . . . (cover from “the interview”) – grab your copy before they’re gone! Music can transport us, via motionless transportation, to places heretofore unknown. And thus began this mix project & elements edition – a meandering blended mixture of Ether & Jazz. Cover image painstakingly commissioned by “the artiste” via Paper by Fifty-Three. Every single ‘Turning In Ambient Drone’ wave is designed to gently guide you into states of deep relaxation, emotional release and inner peace, achieved through underlying binaural frequencies – frequencies designed to physically stimulate both hemispheres of the human brain which is being used to help with the symptoms of post traumatic stress disorder (PTSD). Track No. 1 – Shambhavi Four Hertz Binaural: Length 40:01 min. 4Hz binaural frequency (Delta) thoroughly. Delta waves: Deep, dreamless, restorative sleep. Sleep has its own stages and associated brainwave patterns and more than simply the absence of being awake..
Theta waves: Meditation, deep relaxation, daydreaming, creativity. Track No. 4 – Shambhavi Nine Hertz Binaural: Length 40:01 min. 9Hz binaural frequency (Low Alpha) thoroughly. Alpha waves: Relaxed wakefulness, light meditation. Connection between consciousness and unconsciousness. Beta waves: Physically active and mentally alert, waking day state. Delta waves: Deep, dreamless, restorative sleep. Sleep has its own stages and associated brainwave patterns and more than simply the absence of being awake. 2. check towards the middle of the track if the volume is comfortable since the tracks are being faded int. Note that after some minutes the perception of sound might get more intense since usually our brains adapt to the environmental noise pollution. 3. ideal is if you can lay down and cover yourself with a blanket. Note that after lying still for some minutes your heart-rate and body temperature lowers. 6. the drones are designed to keep you right at the edge between a state of being awake and sleep. If you nevertheless fall asleep the drones get more intense towards the end to gently wake you up. Who’s to say that music has to be the most important thing in your life? Who says that? For our generation, music was important; for me, most certainly. But maybe music is not supposed to be the most important thing. MoonJune’s mission statement: The ongoing goal of MoonJune is to support music that transcends stylistic pigeon-holing, but operates within an evolutionary progressive musical continuum that explores boundaries of jazz, rock, avant, ethno, the unknown and anything in between. Pavkovic was born in Bosnia in the former Yugoslavia in 1962. He was raised in southern Italy and studied Portuguese and Brazilian literature at the University of Bari (Italy) and Afro-Portuguese History and Literature at the University of Luanda (Angola, Africa) en route to becoming fluent in six languages. Before MoonJune, he translated artistic and scientific literature from/to Italian, Portuguese and Serbo-Croatian, and published two volumes of original poetry. Pavkovic established MoonJune Management and Booking, now MoonJune Music, in 2000, copping its name from “Moon in June,” a Robert Wyatt tune on the third album by Soft Machine, one of his numerous prog-rock-jazz-fusion inspirations. MoonJune Records is only part of Pavkovic’s impressive music business reach. As a booking agent, he has coordinated more than 2,000 concerts in more than 50 countries worldwide. Even though MoonJune Records consumes a great deal of his energy and time, he still does not consider it his “main business”; instead, it’s just one more chapter in his lifelong diary of musical surprises. MoonJune Music is the musical equivalent of Forrest Gump’s proverbial box of chocolates. You never know what you’re going to get: An improvisational jazz-rock quintet built around guitar, trumpet, and bass clarinet, named for a North Korean dictator and the martial arts style instructed by Grandmaster “Iron” Kim (Iron Kim Style, 2010); jazz-rock ensemble fusion led by Israel’s version of Walter Becker and Donald Fagen (Breaking the Cycle, Marbin, 2011); or ancient Indonesian temple ritual music and traditional gamelan percussion employed as rhythmic loops upon which jazz players can solo almost forever (Demi Masa, simakDialog, 2009), to name just a few of its far-reaching flavors. Consequently, MoonJune Record reviews seriously stretch a writer’s analytic and descriptive faculties, not to mention ears—this writer’s, at least. In late 2017, Pavkovic assembled the twenty-five track compilation It Must Be Jazz to celebrate the label’s fourth-place finish in DownBeat‘s annual “Best Jazz Label” poll (up from seventh place in 2016) and released it as a free digital download to thank the label’s fans. 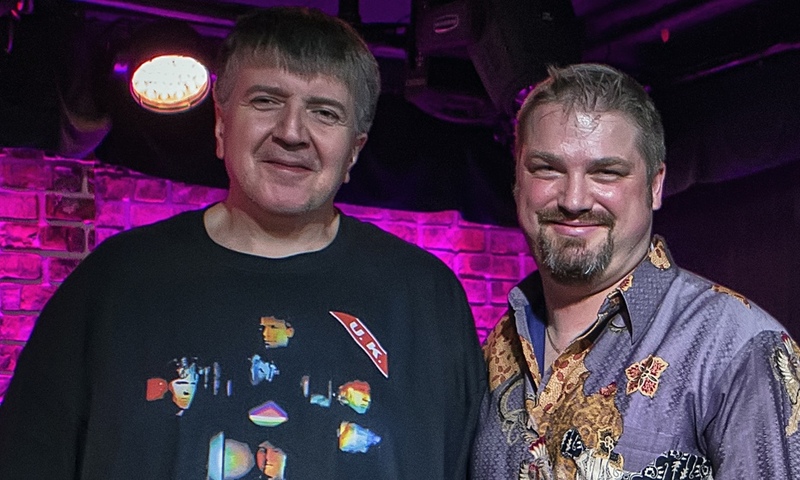 Its title track was jointly composed by guitarist Allan Holdsworth, keyboardist Alan Pasqua, bassist Jimmy Haslip and drummer Chad Wackerman for Blues for Tony, their 2010 ensemble tribute to powerhouse jazz-rock drummer Tony Williams who passed away in 1997. This high-voltage piece of electric jazz-rock fusion was born from sentiment and experience: Holdsworth replaced John McLaughlin for a year as the Tony Williams Lifetime guitarist, and both Holdsworth and Pasqua were members of The New Tony Williams Lifetime. “Like its namesake orb, MoonJune steadily casts its light across a commercially ravaged musical landscape without ever capitulating to the market, a rare paragon of musical virtue in ever more culturally bankrupt times,” suggests guitarist Dennis Rea (Moraine, Iron Kim Style, Zhongyu). How enthusiastic is Pavkovic about music and MoonJune? After we finalized the following 12,000 word interview, he mused, “It’s a bit LONG, but I have so much to say and what I said is only 1.75% of what I would be able to say.” Leonardo Pavkovic exemplifies a profoundly personal yet widely public relationship with music. It’s hard to imagine how the future of this music could be in more caring, capable hands than his. All About Jazz: Where’s the best place to begin the MoonJune story? Leonardo Pavkovic: When I first started the label, I had no background in the music business whatsoever. After I moved from Italy to New York City in August 1990, I met the renowned Brazilian graphic artist and photographer Fernando Natalici, who created the legendary “Studio T” graphic design studio in the mid ’70s. Studio T was almost a cult phenomenon in downtown Manhattan. Fernando himself was a living encyclopedia of virtually everything that happened in the New York music scene during the 1970’s and ’80’s, and soon we became inseparable friends. (Later, I became his business partner). Studio T was known for its large clientele in the city’s music business community, so I was always in the company of great musicians, concert promoters, and record labels owners and executives, from majors and from independents. In the early 2000s, I was briefly involved with the NYC-based label Jazz Magnet Records through a jazz publicist and music industry veteran, the legendary Jim Eigo. This experience was both inspiring and beneficial. Motivated by that experience, I decided to start my own record label and released my first album, a live recording of the legendary saxophonist Elton Dean, who I’d known since the mid ’80’s, while I was living in Italy. Two other live albums of young Italian progressive rock bands quickly followed: Finisterre’s Storybook and D.F.A.’s Work In Progress Live. Another Mix . . .
A favourite producer of Lucidflow, Dub Taylor is the deeper, dubbier alias of Alexander “Tigerskin” Krüger – best known for his releases across the highly regarded Dirt Crew, Morris Audio, Dessous imprints to name a few. As Dub Taylor, he popped up on Lucidflow co-owner Nadja Lind’s epic ‘Brain Candy’ remixes album – taking After The Rain through a slowly swinging harmonic dub workout. However, his debut release on Lucidflow ‘Path Beyond Ego’ sees the Berlin based producer in vibrant and energetic form. This is epitomised in lead track ‘Get Up Dub’. Rolling and hypnotic, the melodic elements sit low in the mix like a blanket of murky mist, perforated by the shout of “GET UP!” throughout the track. Direct and effective, it begs for the long undulating mix treatment from DJs in full mastery of their pitch control skills. Equally rolling is ‘Lamma’, whose tumbling beats drive the track. Resonate dub chords straddle the dived between percussive and harmonic, twanging in the background. As the track progresses, the brassy melody that rises eventually flourishes into a string led breakdown. Like a dolphin breaking the surface of the ocean, it arcs in the air before diving back down into the aqua with graceful ease. Finally, ‘Ten O’Clock Dub’ marries half time elements over the steady footsteps of the house tempo. The uptempo heartbeat retains a vibrancy but the mood is most certainly more languid. The traditional organic dub backing sits perfectly with the modern electronic template set out by pioneering dub labels such as Basic Channel and Maurizio. Experimental music is a genre that has been overlooked in Vietnam. The number of artists active in Hanoi, Saigon and abroad is small. The first generation of experimental musicians appeared in Hanoi in the 1990s. Late 2000s and early 2010s, the second generation of Vietnamese experimental musicians started developing. All tracks by listed artists.